I have decided to close this trade out today as price action suggests that the market will continue to the push the pair lower. I suspect this is as inflation becomes a focus for the MPC, and it looks like we have plenty of data out this week for the UK that may continue to push that sentiment further. So, we took a very minor hit on this trade, but I feel it was time to move on. Currencies are going to continue to be choppy as markets remain uncertain and as we head into the summer. It’s gong to be tough, but let’s stay positive and focused! After my last update, EUR/GBP slowly rallied higher, and after missing our first profit target by about 1 pip, the pair fell lower at the open of the European trading session as the Pound rallied against the Euro. Support was found around .7880, at which we are trading around at this time. With it being the end of the week, I may close out this position at the end of the trading day. Stay tuned! Volatility has brought EUR/GBP back to .7900 where our long position was triggered. The pair found buyers at that level and took us up about 30 pips before pulling back to current levels around .7920. So, we’ve got a bit of profit going on right now, and for the pair may stall for the rest of the day as the Euro/US overlap comes to an end. I will continue to hold on to the pair, and with the end of the week approaching, I may consider making adjustments. Stay tuned! Good day mates! We have a short term trading opportunity forming on EUR/GBP today as the pair drifts lower towards a rising trendline. 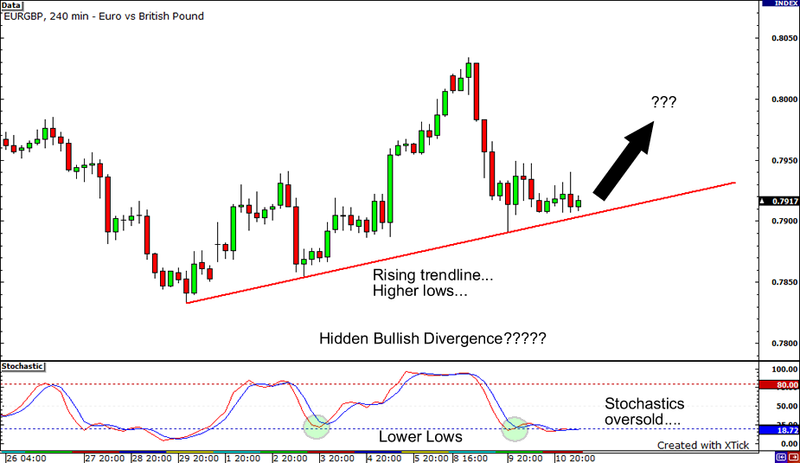 On the chart, we have a bit of hidden bullish divergence forming as prices have made higher highs, while stochastics has just formed a lower low as the indicator signals oversold conditions. I think we may see support at the trendline and with expectations of the ECB possibly raising interest rates in the Eurozone, it’s a strong possibility that the Euro may resume its rise against the Pound. So, I’d like to go long, but wait to see if the pair will hit .7900 before doing so….